Bill Windsor is alive and well and free at 7:15 am Pacific Time on January 5, 2015 en route to somewhere, but maybe not where originally planned or at least when originally planned. 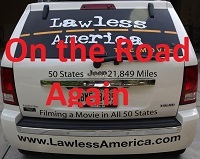 Bill Windsor is resuming filming for Lawless America...The Movie as well as a video abut the Ellis County Texas Mafia and Joeyisalittlekid and Hargove Real Estate of Red Oak Texas. Bill Windsor's vicious, evil cyberstalkers (known as Joeys) include political figures in Ellis County Texas, like Bill Houston, mayor of Midlothian. Midlothian is also home to corrupt Judge Bob Carroll and his wife Kathy A. Carroll, who is reported to be a Joey. Bill Windsor has also been told that ther Joeys include Ellis County Law Enforcement officers, including the#2 man in the Ellis County Sheriff's Department, Dennis Brearley, and Waxahachie police officer Abe Partington, IV. Thanks SO MUCH to Mary, Cruz, Debbie, and others for sending information to media galore about the efforts to lock me away to stop Lawless America...The Movie. Perhaps our best hope for the movie (and me) is for mainstream media to report this story.... This article might be a good link to send.